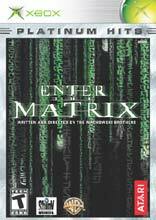 The Game has a similar story line to that of the second matrix movie The Matrix Reloaded. In the game you will be able to play as either Niobe the ships captain, or Ghost a weapons expert. From time to time Neo will drop in and fight alongside of you, but you will have no control over him.As far as cool action sequences this game has it all, from the slow motion, to the back flips off of walls, to running up walls and kicking two enimies with both of your feet. There are over 4000 motion captured moves that will have you feeling as though you are in the matrix. There are a host of other great highlights to this game and they will keep you coming back for more.